If you LIKE this recipe, please share it or Repin it on Pinterest. I made this for lunch today to serve with some leftover potato leek soup, and it was perfect. 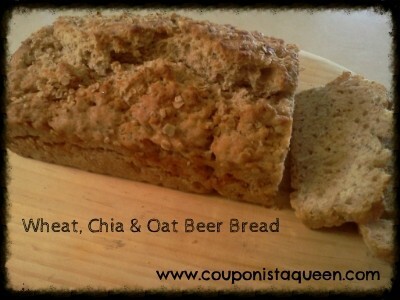 Hearty and filling, make this Wheat, Chia, and Oat Beer Bread in just over an hour with no yeast — a can of beer provides the rising action. Important Note: You do need to SIFT together the dry ingredients or the bread will be hard like a brick. 1. Preheat the oven to 375° and grease a full-size loaf pan. I used baking spray. 2. Sift together the following: 1-1/2 cups of white flour, 1 cup of wheat flour, 1/2 cup of rolled oats, 3 tsp of baking powder and 1/2 tsp of salt. Stir in 2 tablespoons of chia seeds. 3. Pour in a 12-ounce can of alcoholic beer of your choice. Room temperature is best. I used Bud Select because it is low calorie and because that is what we had handy. 4. Mix until dry ingredients are all moist. Pour into loaf pan and allow to rest for 2 minutes. Pour 1/4 cup of olive oil over the top. Sprinkle with some extra oats if you like. 5. Bake for 1 hour, turning pan after 30 minutes. Watch the top and if it starts to brown too much, cover loosely with foil. After the hour, remove from oven and cool in pan a few minutes. Transfer to wire rack and cool another 10-15 minutes before slicing. After loaf cools completely, wrap in plastic and store up to 2 days. This is great warm from the oven or sliced and toasted the next day.